With a special appearance by Mother Hubbard! 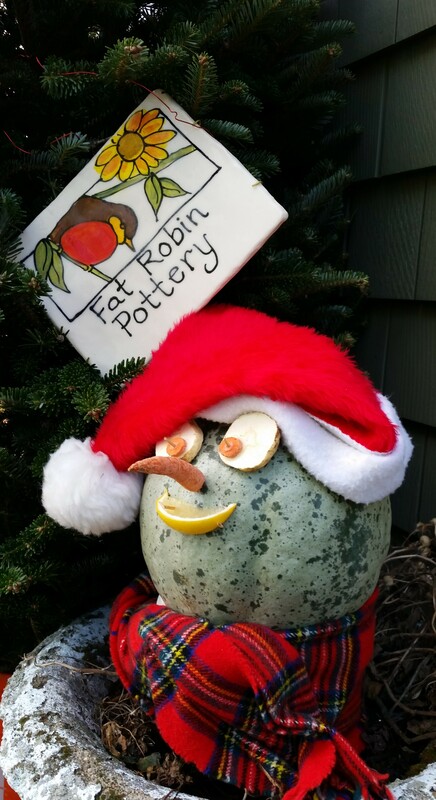 Please excuse me for adding to your Social Media Holiday Blitz Overload as I invite all to the Fat Robin Pottery Open House on Sunday from 11:00 a.m. to 4:00 p.m. It’s a chance for new faces and new customers (as well as constant companions) to see all of my pottery work, which includes a lot of techniques (slip trail, pit fire, sgrafitto) that I did not bring to the fall fairs I took part in. 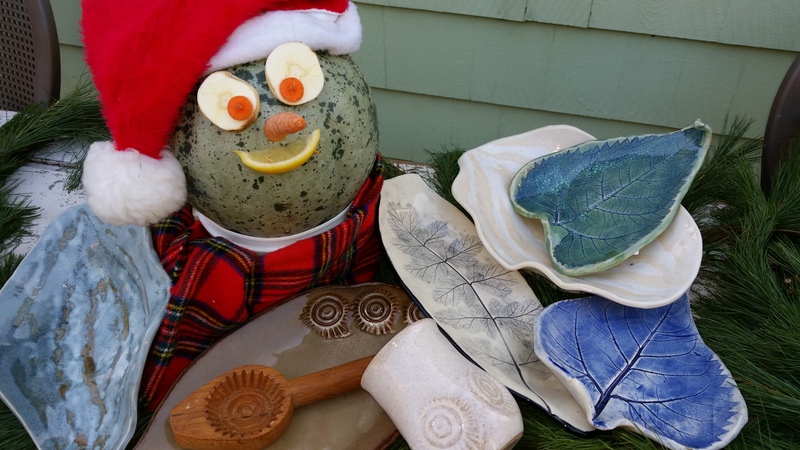 The Robin’s Nest (my heated garage here at 26 Simmons St., Newport) is well stocked with my garden leaf pieces, hubbard squash bowls, mamool ware (Lebanese cookie imprints) mugs, bowls, and trays, and a wide variety of one of a kind pottery pieces. 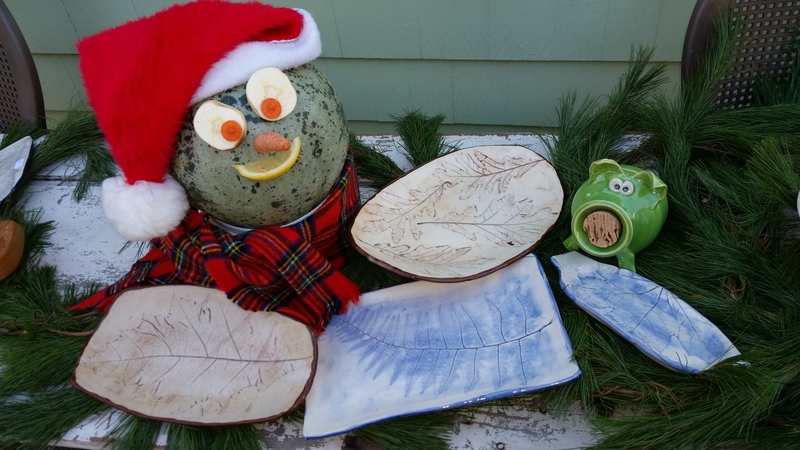 Christmas ornaments are currently firing in the glaze kiln and will be cool enough to hang on Sunday. P.S. Can’t make it? call or email to set up another time to stop by….I’m here every day–this is what I do! Visa, MC, Discover (thanks to my Square reader), cash, checks, or a lovely pinot noir as forms of payment….. In the past few months, I’ve crossed the country a couple times. In June, I flew to Salt Lake City and my younger daughter, Amber, met me , and we aimed her car for Rhode Island. She had been living out west for many years, mostly Jackson, Wy and she wanted a change; so she and her dog were moving back to Newport. On our mother/daughter road trip we visited old friends, old places, listened to good books, good music, avoided tornadoes, rated Days Inns, and renewed an interest in Diet Dr. Pepper. This country is HUGE! In August, I visited my older daughter, Lily, in the Minneapolis area, and discovered the true meaning of Minnesota Nice. 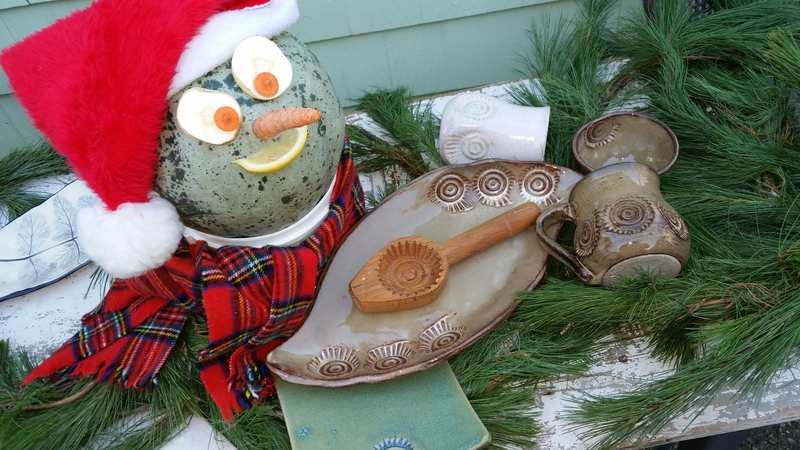 Between trips, I’ve been exploring and playing in clay and working on my 2014 fall line up. Always looking outside for intent and interest, I was drawn to the leaves in the garden. 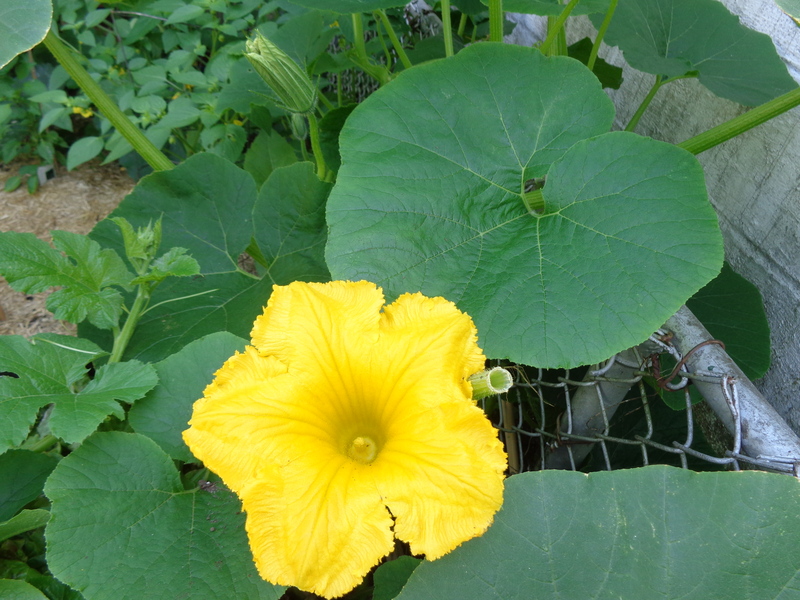 Along with the interesting zucchini leaves, something was growing out of my compost pile. 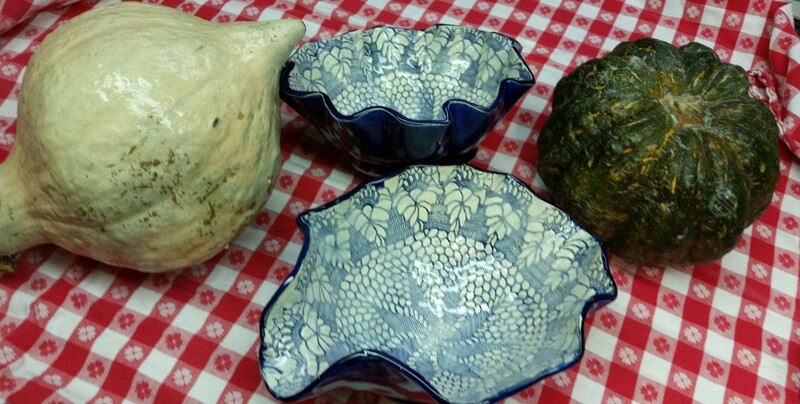 At first the zucchini leaves and the compost mystery plant leaves were small, and once impressed into clay slabs they became small bowls or saucers. 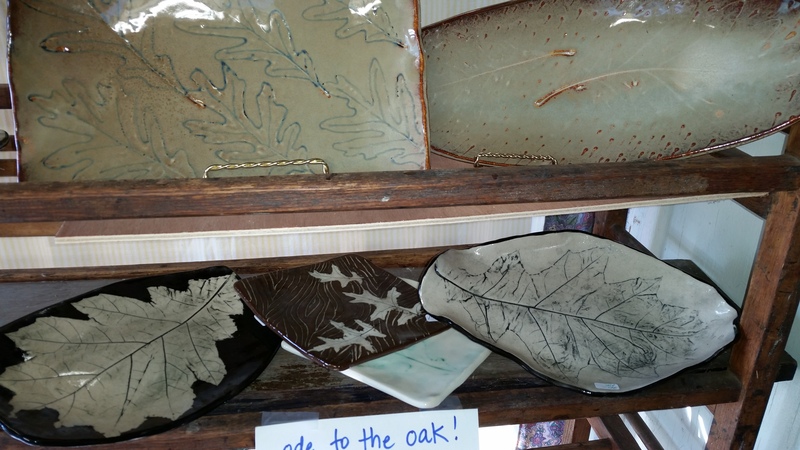 But then the leaves kept growing, and the leaf slabs became bigger bowls and trays and serving pieces. 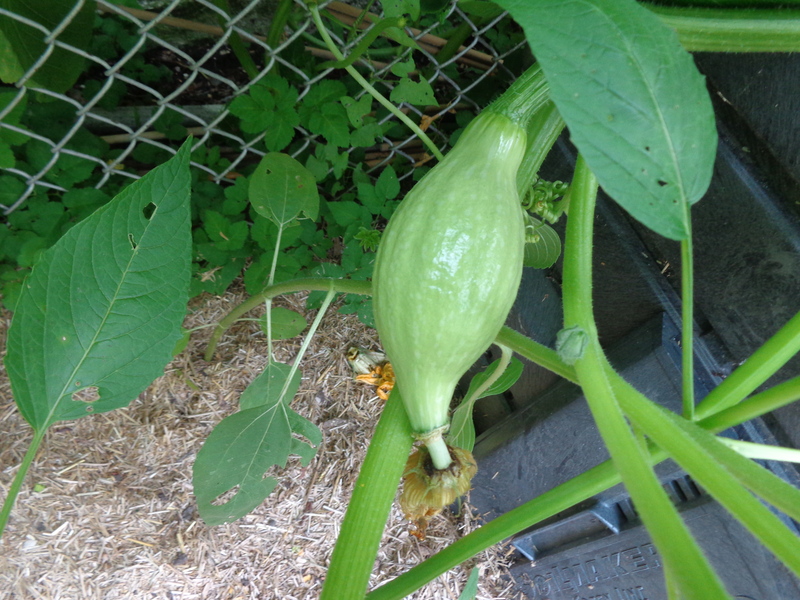 The compost mystery plant formed buds, then flowers, then set fruit. AH HAH! 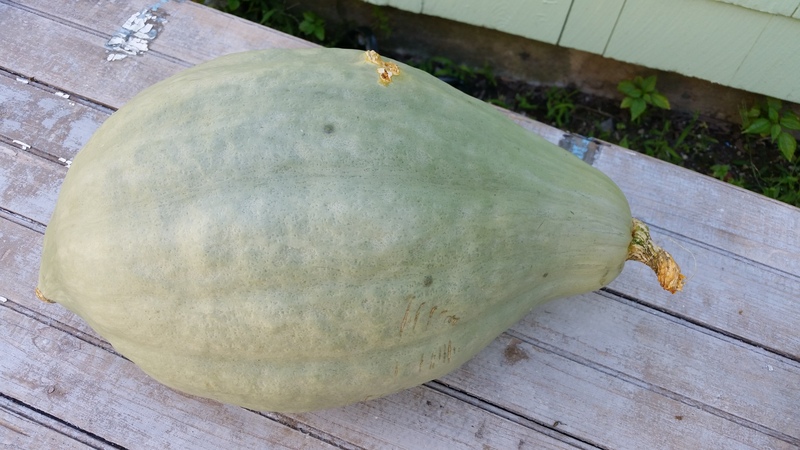 the mystery plant was no longer a mystery–it was a second generation hubbard squash which emerged from the seeds of the hubbard squash I used last year–it was a, SON OF A HUBBARD! 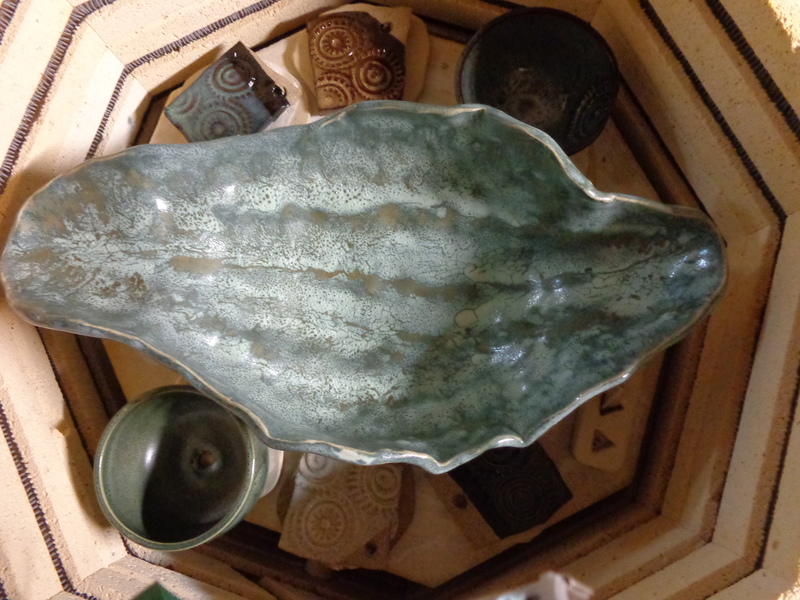 It was fate–I am now working on my 2014 hubbard bowls! One never knows what will bring inspiration. 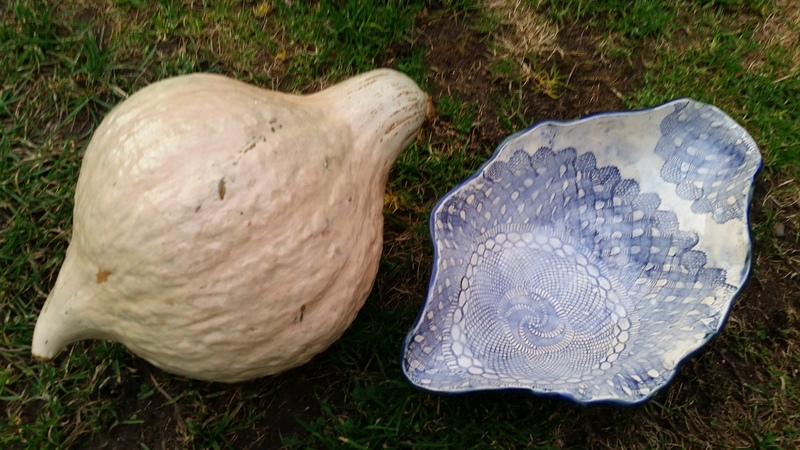 Along with the colorful maple and oak leaf carpets on my neighborhood walk, the blending of the blues and grays and greens on a hubbard squash presented by a friend caught my imagination. 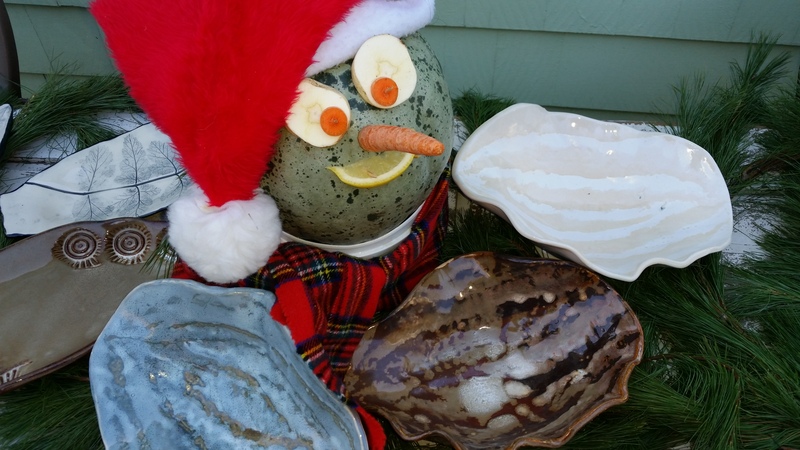 A large squash shaped bowl on anyone’s Thanksgiving table would look great. 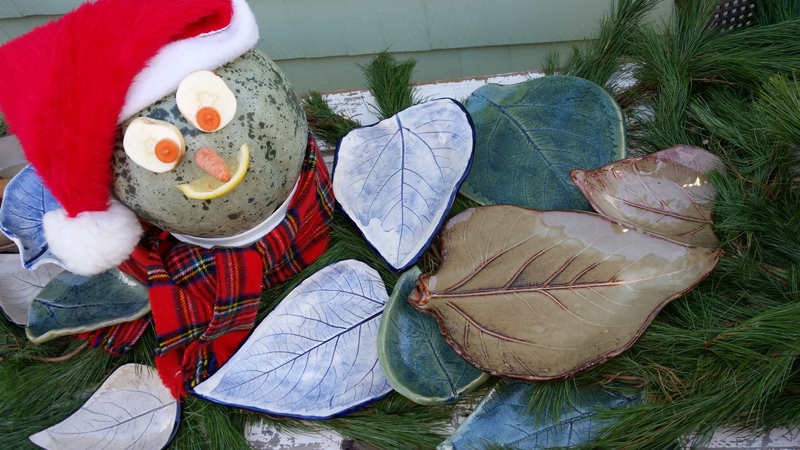 Clay slabs were rolled and draped over the squash. 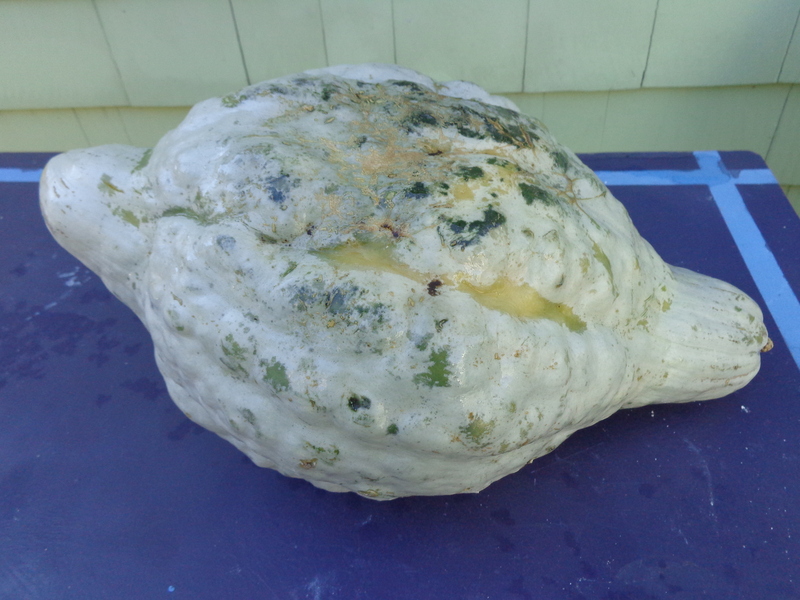 While the clay was draped, it was gently pressed to imprint and to highlight all the irregular skin texture of the squash. 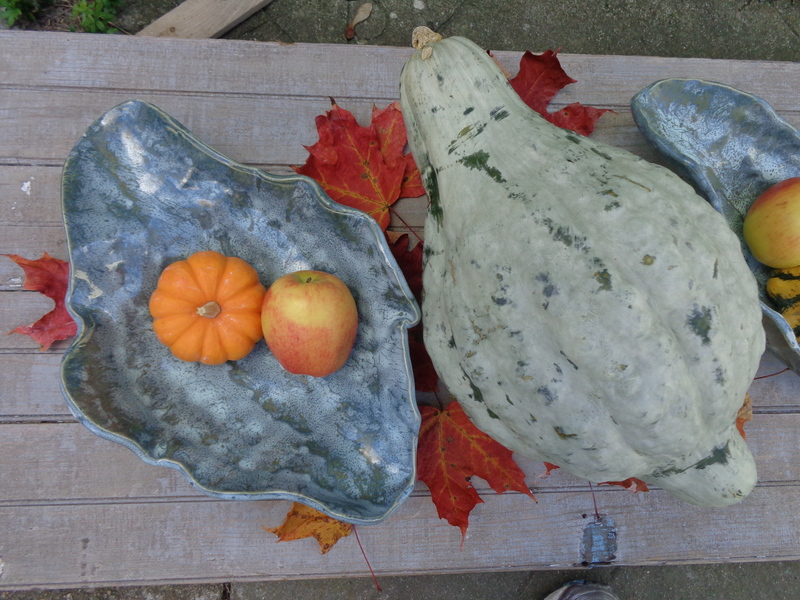 Once firm, the squash bowl was released from the “hubbard mold” and positioned to sit on a flat surface. 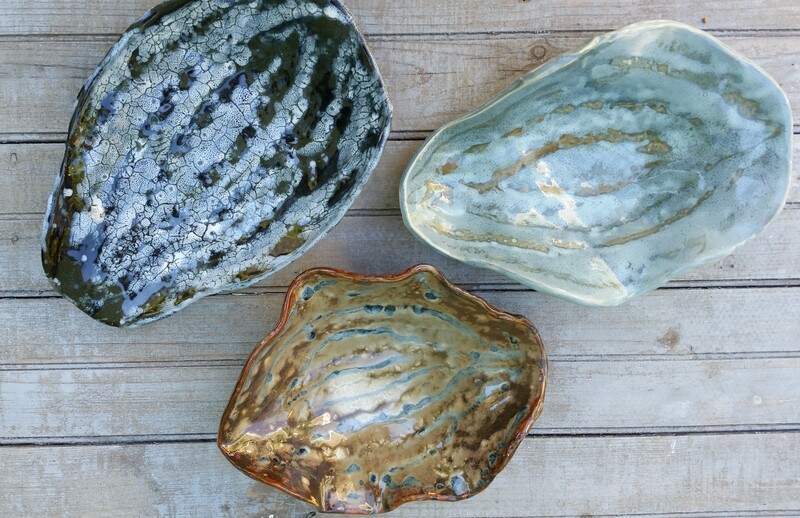 I experimented with feet for the bottom of each bowl. 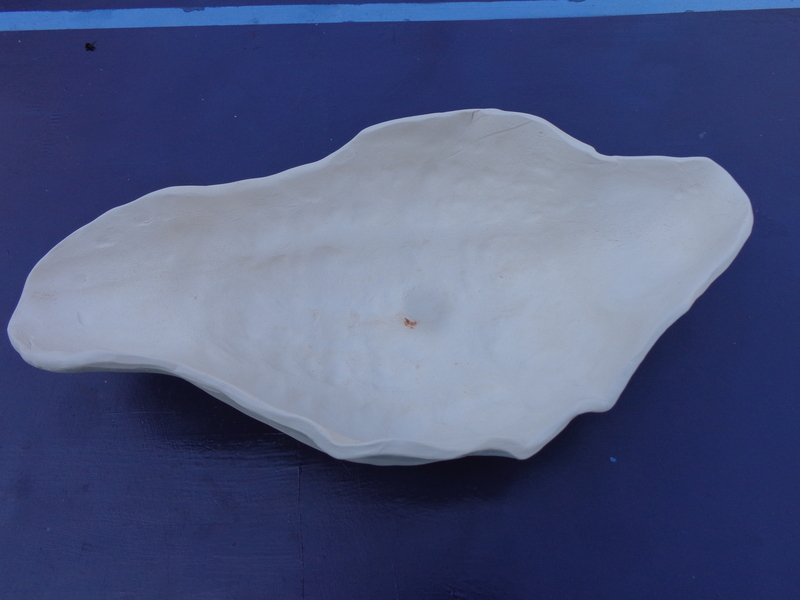 Once happy with the way the bowl was sitting on the table, the edges were wiped and softened and the bowl set to dry. 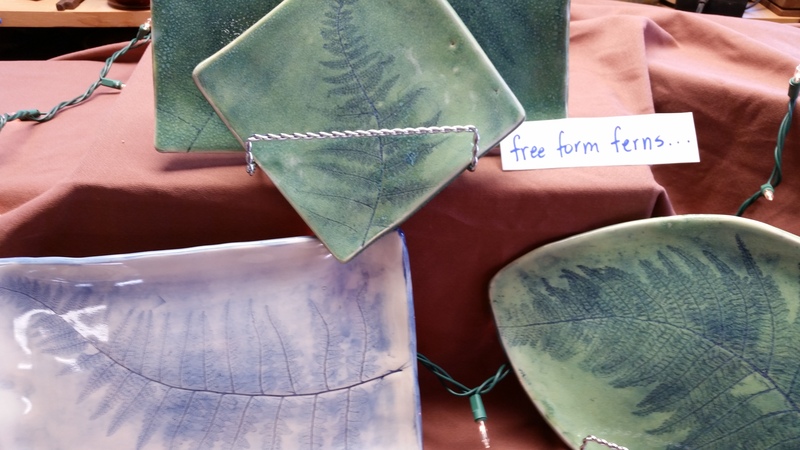 After a successful bisque, glaze experimentation was done on small test pieces which resulted in a suitable glaze color choice. 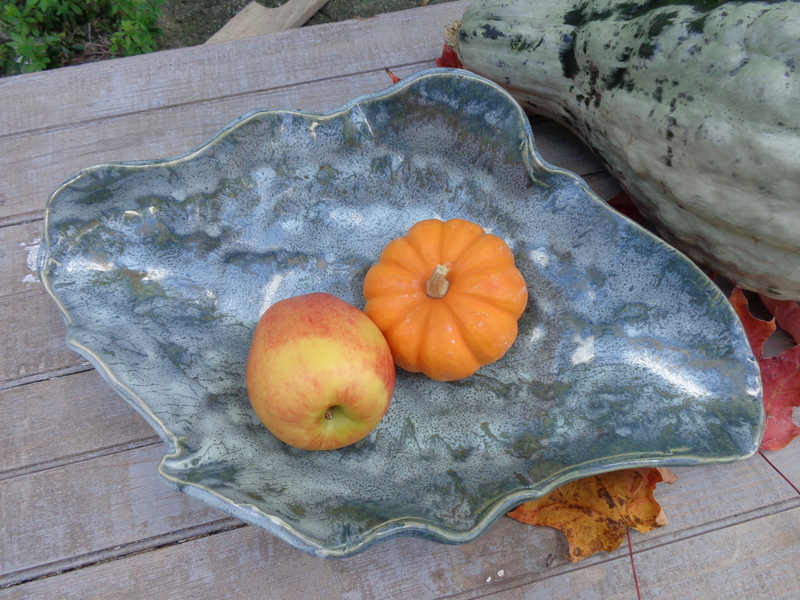 The bowls were then glazed and successfully fired, Next frontier–butternut squash! 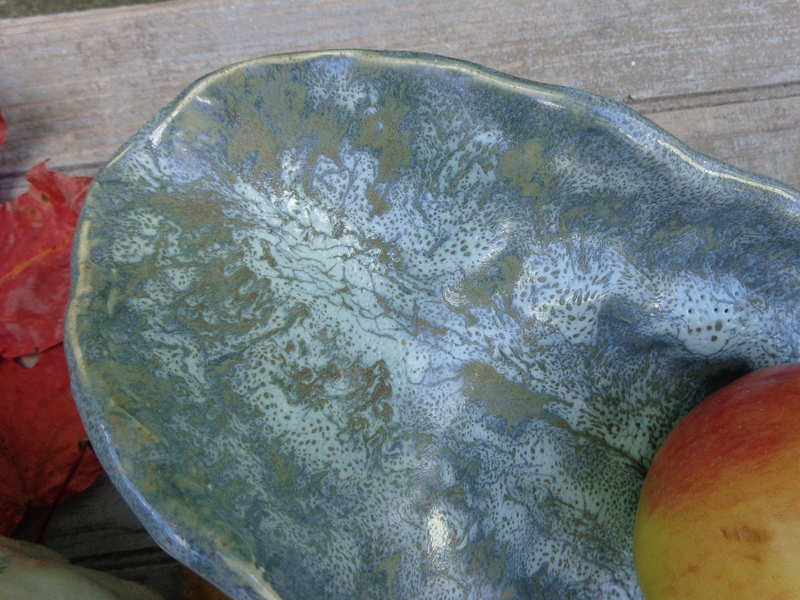 And I will make a few more hubbard bowls before my organic mold decomposes. My thanksgiving table will definitely look colorful this year.